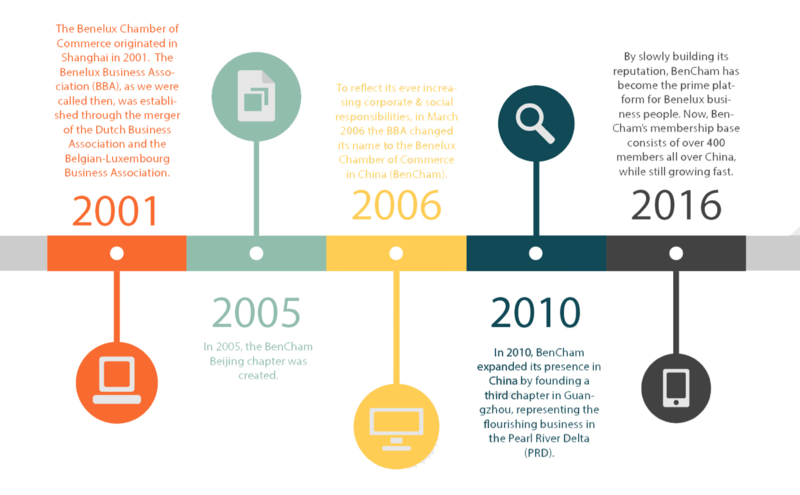 The Benelux Chamber of Commerce - BenCham - is the most active Benelux business platform in China. Its members, leading companies from Belgium, the Netherlands and Luxembourg, share an active interest in developing trade and business in China. It is the only Chamber of Commerce that is officially recognised and supported by the Embassy of the Kingdom of Belgium, the Embassy of the Kingdom of the Netherlands and the Embassy of the Grand Duchy of Luxembourg in China. BenCham has been growing at a steady pace since it was established in 2001. It currently contains 3 chapters; Beijing, Shanghai and Guangzhou (Pearl River Delta). It is the prime platform for the Benelux business community to get together. BenCham currently has over 350 members, aspiring to grow further every day. Its base consists of Large Enterprises, Small and Medium sized Enterprises (SMEs) as well as individuals with an active interest in developing their business in China. As an independent, non-profit organisation, BenCham is managed by a full-time secretariat of both Benelux and Chinese staff. All practises are guided by an active Board of Directors. BenCham sustains itself through government subsidies, membership subscriptions, sponsorships and event fees. On May 27, 2010, BenCham received the Accreditation Certificate from the BLCCA (Accreditation Programme for Belgian and Belgian-Luxembourg Chambers of Commerce Abroad).